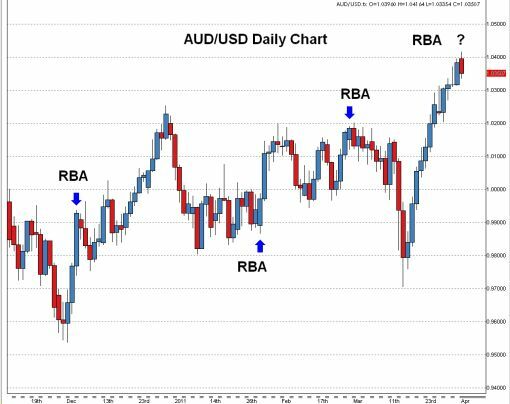 The last 3 times the RBA made a monetary policy announcement, a small to large reversal was triggered in the Australian dollar. RBA rate decisions can frequently mark a top or bottom in a currency -- this does not happen 100 percent of the time, but given the number of considerations that go into an interest rate decision as well as the impact that high interest rates have on the attractiveness of a currency, we can understand why it is such a big market mover. In fact, the main reason why the Australian dollar has had such a nice run in recent is because of its high interest rate. As a result, A$ traders need to be particularly wary of the possibility of the RBA decision triggering a top in the AUD/USD.